Other Names: Shunthi, Ardrakam, sheng, Jiang, black ginger, Ginger, race ginger, Adrak, Sunth, African ginger. The main active part of the herb is its root. The mother region of this herb is South-east Asia. Still, the plant is grown artificially in China, India, the USA, tropical areas and West Indies. This plant of a creeping type is characterized by thick root. Its life interval lasts for several years. Its initial stage of development is marked by the appearance of strong stem, on which grow long leaves (15-30 cm). The leaves change year after year. The scape which holds the flower grows from the rhizome. The flowers are yellow or white-colored. The main compounds for which ginger is known and widely used in herbal medicine are volatile oils. These oils form the overall idea on the herb and have a special smell and taste. The basic elements contained in volatile oils are bisabolene and zingiberene, and the ones having a sharp smell are shogaols and gingerols. Ginger was discovered as a potent medicine over 2000 years ago. Asian medical specialists were satisfied by its potential and applied it for elevating the overall body condition through inhalation of its vapors. 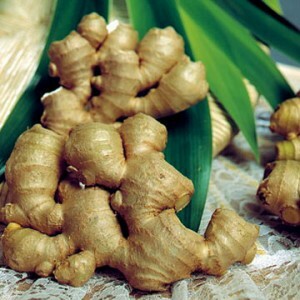 Nowadays ginger is known all over the world and applied in many spheres of herbal medicine. The remedy is used to wash away the excess liquid from the body through urine, saliva and sweat excretion, helps stimulate digestive system, improves its functionality, works good as an expectorative medicine. The herb is also applied locally on different body parts to stimulate blood circulation in the area. The plant is widely applied in many spheres of human health, including diseases linked to digestive system (any pains, spasms, colics, constipation), eyes, respiratory system (used to treat cough, provoked by colds, bronchitis, to soothe the sore-throat and so on). Ginger is also applied for nausea, headaches and heart problems. For problems with digestive system, spasms, abdominal pains, and different types of cough ginger-jam is the best remedy. Fresh ginger is added to water, where it’s combined with sugar (cane sugar best). The mixture is boiled to the condition of a syrup. Clove, cardamom, and saffron are additionally put to the mixture. Sore-throat and laryngitis can be treated by chewing fresh ginger leaves, as it stimulates saliva excretion. Nausea can be avoided by just combining onion juice with ginger juice. For getting a relief from bowel or stomach spasms ginger juice is mixed with castor oil. Ginger is also used as a remedy for motion nausea, and as an anti-bacterial remedy for meals, especially meat. Cough can be treated by tea, made of fresh ginger and supplied by honey. The commonly used dose of ginger is 3 grams on average, taken 3 times a day. In form of infusion ginger is dosed in 2 ml on average. As a remedy for sickness ginger is taken in doses of a gram quarter several times a day (not more than 1 g a day). Ginger is also sold in dosed pills, tablets, or drops. If there is a potential possibility of gallstones or a history of their treatment. In case there are symptoms of fever, especially local (lungs, abdominal area). In case you take the medicines to fight insomnia. Ginger is known to enhance their effect. If taken on a regular basis, ginger can impede the assimilation of dietary vitamins. In case of surgery ginger should be avoided for a period of two weeks before the procedure. Pregnant women should use ginger with caution. Its casual application is safe, however, taking it daily is unreasonable. You should also remember that ginger is known to enhance the effect of remedies used to attenuate blood. For this reason ginger can become a cause of excessive bleeding. If the risk of it is higher than normal, you should necessarily consult your health-care provider before using the herb.